How Do I Create Run Charts in Excel Using SigmaXL? Click Sheet 1 Tab of Customer Data.xlsx (or press F4 to activate last worksheet). Click SigmaXL > Graphical Tools > Run Chart. Ensure that entire data table is selected. If not, check Use Entire Data Table. Click Next. Select Overall Satisfaction, click Numeric Data Variable (Y) >>. Select Show Mean. Uncheck Nonparametric Runs Test (to be discussed later in Part N of Analyze Phase). Click OK. A Run Chart of Overall Satisfaction with Mean center line is produced. 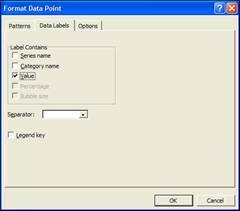 A label can be added to a data point by two single-clicks (not a double-click) on the data point, followed by a right mouse click, and select Format Data Point. Select Data Labels tab, check Value (Excel 2007/2010: Single Click on data point, Right Click, Add Data Label). See also SigmaXL Chart Tools > Add Data Label in Control Phase Tools, Part B - X-Bar & Range Charts.